Because this acts as my sixth review of 1991’s Terminator 2: Judgment Day, I’ll cut short my usual comments about the movie. If you’d like to read my full thoughts, click on this link. To summarize, T2 remains one of the few sequels that betters the original flick and it offers an all-time great action film. Despite some dated visual effects, the movie holds up well after more than 25 years and continues to thrill. Terminator 2: Judgment Day appears in an aspect ratio of approximately 2.40:1 on this 4K UHD Disc. Expect a mixed bag from this presentation. Sharpness became a strong point, as the movie offered very good clarity and definition. However, the transfer went with a bit too much digital noise reduction to remove grain, a factor that could render skin tones a little “plastic”. This meant that as sharp as the image tended to be, it could appear somewhat artificial. No signs of jagged edges or shimmering occurred, and I saw no print flaws. In terms of palette, T2 opted for a heavily teal orientation. Though always a film with a lot of blue to it, this version offered a clear difference in color timing, as prior versions came with more varied tones. Given the parameters, the hues looked fine, but they didn’t represent the original film. Blacks appeared deep and dark, and shadows seemed positive, with nice delineation of low-light shots. While the 4K offered some real strengths, the DNR and color choices made it less appealing. For this release, we got a DTS-HD MA 5.1 soundtrack. It provided a pretty robust soundfield that encircled the viewer throughout the movie. The forward spectrum sounded lively and active, as I heard audio from all three front channels nearly all the time. Quality also seemed excellent. Although much of the dialogue had to be dubbed - and further altered since Edward Furlong’s voice changed during the shoot - speech always sounded natural and distinct, with no edginess or problems related to intelligibility. How did the 4K UHD compare to the 2015 Blu-ray? Audio remained identical, as this disc’s 5.1 mix replicated the material from the Blu-ray. Visuals offered obvious differences – some for the better, some not. On the “better” side, the 4K looked much sharper and more precise, and it boasted deeper blacks. On the “worse” side, the 4K felt less natural and “film-like” because it scrubbed away grain and altered the colors too much. As I noted earlier, T2 was always a movie that leaned blue, but not to this degree. I switched back and forth between the 4K and the 2015 BD – the difference in colors startled me, as the 4K lost virtually all of the warmth and range from the BD. So the $64,000 question: which version did I prefer? Though I like the added definition of the 4K, I’ll view the 2015 Blu-ray in the future. Even with lower resolution, it offers a better representation of the way the movie should look. A major gripe for fans, the 4K also comes with only one version of T2: the original theatrical cut. Ever since 1993, we’ve been able to view a “Special Edition” of T2 with an extra 17 minutes of footage. I don’t have a strong preference between the 1991 theatrical cut and the 1993 SE, but I think the 4K should’ve included both. Fans have enjoyed the choice for too long to lose it now. No extras appear on the 4K itself, but a Blu-ray copy includes some elements, and it offers all three versions of the film. This means the theatrical cut (2:17:07), the Special Edition (2:33:13) version absent from the 4K and an Extended Special Edition (2:35:55) also not found on the 4K. For my longer comments on the differences among the cuts, please go back to the link I posted at the start of the review. As I mentioned a few paragraphs back, I think the theatrical and SE versions are both good and have no strong preference between them. The ESE doesn’t do much for me. Next we get two previously-released audio commentaries. Narrated by "creative supervisor"/visual effects coordinator Van Ling, the production commentary includes info from director James Cameron, sound designer Gary Rydstrom, casting director Mali Finn, composer Brad Fiedel, production designer Joe Nemec, visual effects creator Dennis Skotak, lead makeup artist Jeff Dawn, co-producer Stephanie Austin, composer Brad Fiedel, ILM Animation Supervisor Steve “Spaz” Williams, sound mixer Lee Orloff, police consultant Randy Walker, stunt coordinator Joel Kramer, ILM visual effects supervisor Dennis Muren, effects designer John Bruno, puppet creator Stan Winston, editor Mark Goldblatt, ILM’s Mark DiFay, effects creator Gene Warren, and actors Arnold Schwarzenegger, Linda Hamilton, Robert Patrick, Joe Morton, Michael Biehn and Edward Furlong. It features recordings of participants that were done individually - no, they didn't cram all those people into one room. Although the commentary provides a nice general look at T2, I must admit I've always found it moderately unsatisfying. Partially this occurs because of the mass of participants; we hear so many different voices that continuity can be an issue. Ling does a nice job of wrangling all the speakers, but he ends up doing much of the talking. While Ling's a good source of information, it seems illogical to have so many different options yet we get so much from one fairly minor member of the film crew. No offense to Ling, but I'd sure rather hear more from Cameron, Schwarzenegger or any number of other more prominent contributors. Ultimately, I like the track and think it adds some solid information, but I still feel it could have been much better. From the 2003 Extreme Edition, we get a track with director James Cameron and screenwriter William Wisher. Both sit together for this running, screen-specific track. The publicity folks behind the 2003 DVD made a big deal of that fact, as this was Cameron’s first-ever commentary of this sort. That set up some high expectations, and happily, the track met them as it offered a very entertaining piece. Not surprisingly, Cameron dominates the commentary, and that causes my only complaint: he frequently interrupts Wisher to interject his own thoughts. Actually, this tendency decreases as the program progresses, largely because Wisher starts to give Cameron a taste of his own medicine. I guess the writer decided to turn the tables on his old boss, and it worked. Problems with interruptions aside, the commentary really does offer a lot of great information. The pair cover many different aspects of the story and the script and explain how various parts of it came to be. Cameron also discusses a lot of technical aspects of making this complicated flick, and he still finds time to toss in many fun and interesting anecdotes from the set. I wouldn’t call this commentary one of the all-time greats, but it’s well above average and T2 fans should really enjoy it – I know I did. 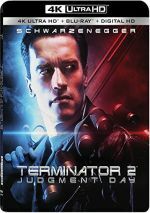 From 1991, the Making of Terminator 2, a 30-minute, 53-second piece that includes comments from writer/director James Cameron, special makeup producer/Terminator effects producer Stan Winston, ILM VFX supervisor Dennis Muren, ILM assistant VFX supervisor Mark Dippe, ILM computer animation supervisor Steve Williams, and actors Arnold Schwarzenegger, Linda Hamilton, Edward Furlong, and Robert Patrick. 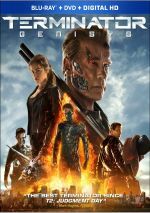 A new show circa 2017, T2: Reprogramming the Terminator runs 54 minutes, seven seconds and features Cameron, Schwarzenegger, Patrick, Furlong, Wisher, Morton, Fiedel, Austin, Muren, cinematographer Adam Greenberg and executive producer Mario Kassar. It looks at the film’s path to the screen, story/characters/script, cast and performances, music, sets and locations, stunts and action, effects and cinematography, and the movie’s release. With all the info from the commentaries and the 1991 program, “Reprogramming” doesn’t unturn too many new stones, but that’s not a major issue. It still offers a tight, engaging look at the production that proves to be thoroughly enjoyable. Two Deleted Scenes appear. “T-1000’s Search” (1:28) shows the terminator as he inspects John’s bedroom, while “Future Coda” (1:50) offers the ending that came with the Extended Special Edition. We can watch the scenes with or without commentary. “Search” provides notes from James Cameron and Robert Patrick, while “Coda” features Cameron, Linda Hamilton and Stan Winston. We get some useful notes, though oddly, the “Coda” commentary cuts off Cameron in mid-sentence. Finally, the disc offers Trailers. One of these advertises the 2017 3D reissue, while the other three come from 1991. One of the all-time great action flicks, Terminator 2: Judgment Day remains very entertaining and exciting after 26 years. The movie doesn’t qualify as my favorite in the genre, but it’s quite close to the top. The 4K UHD presents excellent audio but visuals become a mixed bag, and the set loses many of the already-existing supplements, though it does include a good new program along with some commentaries. Though the 4K isn’t a bad product, it fails to accurately represent the film as originally intended.